Ahhh, Spring is in the air... and in our home now!!! 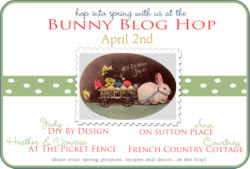 I meant to get this post up yesterday in time for the big Spring Decor Linky Parties, but had some technical difficulties (nothing more frustrating than that, I am sure you fellow bloggers can agree). Anyway, I am very excited to get some Spring/ Easter decor started in our house because this year we actually have family coming to visit for Easter! It will be the first Easter in 5 years that Alex and I won't be alone! Oh, so many Easter tablescapes dancing in my head! Side note: These photos remind me to be thankful that I got a newer nicer camera since then, yuck! And now, here is our 2012 Spring Mantel. Sort of similar I know, but I love the updated and more balanced look. I only bought three new items for this mantel, the rest were items we had in the house or basement from last year. One of the new items was this clearance metal bird Christmas ornament from Pottery Barn- picked it up for just $1!!!! It fit perfectly in the center of our candle holder. ﻿I also removed our candles from the metal candle holder and placed a few faux speckled eggs in their place. ﻿Over on the left side of the mantel, I ended up using the same framed skeleton key burlap that I used for my Valentine's mantel (just removed the felt heart). I was still loving it as is but I added another $1 clearanced Pottery Barn Christmas ornament over the top of the frame. Behind the frame is an old metal wire charger I got from Target about 4 years ago, still love it! On the right, is another one of the metal chargers from Target (a lot of people that come to our house think they are from an antique store). Along with the charger is my mini birdcage filled with faux moss rocks. Lastly is that little nested metal bird- another $1 clearance score from Pottery Barn! Those ornaments certainly worked well for Spring and I love the vintage industrial look. That's a wrap for the Spring Mantel! Time to link up!